Safe & Vault Services offer skilled emergency safe opening, 24 hours a day, across the whole of Ireland. Safe & Vault Services offer emergency safe opening across the entire island of Ireland. We regularly open safes after lost keys, overset time-clocks or faulty locking mechanisms. Make sure you get the best in your time of emergency! Please see our page on Emergency Safe Opening for more general information. Safe lock picking involves the use of precision engineered picking tools by highly skilled safe technicians to mechanically manipulate safe locks open. Safe picking is always the best choice as it results in no damage to the lock or safe. Nearly all (>95%) of safe and vault key locks can be picked open. Safe & Vault Services have the most extensive range of the latest safe picks in Ireland, and pick open safe locks as standard. After picking open a safe, the lock is replaced and two new keys are supplied. This is included in all of our quotes. Safe & Vault Services can pick open your safe or vault. After picking opening a lock, Safe & Vault Services will alter the lock (so any old keys will not work) and cut two new keys to suit as standard. Almost all safe keys can be cut on site. Extra keys will be charged accordingly. Sometimes a safe cannot be picked and it must be drilled open. This can happen if combination codes are lost or if the safe locking mechanism has developed a fault etc..
All of Safe & Vault Services technicians are equipped with high powered drills and hardened precision drillbits so that if we must drill, we do so with minimum damage to the safe. Safe & Vault Services also has a bank of over 10,000 images of safes to help us choose the most efficient drill points. After opening, all holes are filled with drill-resistant harden pins. Safe & Vault Services has never cut open a safe. Safe & Vault Services we can open your safe or vault with minimal damage. If a call-out is aborted after an engineer has already arrived on site, then there will be a charge at an appropriate rate for the call-out. Attendance after other engineers have failed to gain entry and where their actions have worsened the situation will result in a charge at a premium rate (double the standard rate). 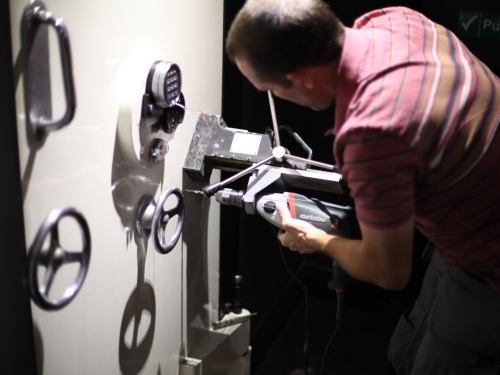 Safe & Vault Services repair any faults with safes or vaults. We are experienced in repairing stiff doors and unreliable locks, replacing broken or missing handles and servicing safe deposit drawers. Safe & Vault Services offer maintenance services for any type of safe or vault. Please email or call if you are interested in a service contract. Safe & Vault Services are equipped to move safes. We can move safes to other rooms inside premises as well as between premises. Please call 01 906 5461 ⁄ 087 681 7718 for further information. Safe & Vault Services offer a safe disposal service. Please call 01 906 5461 ⁄ 087 681 7718 for further information.